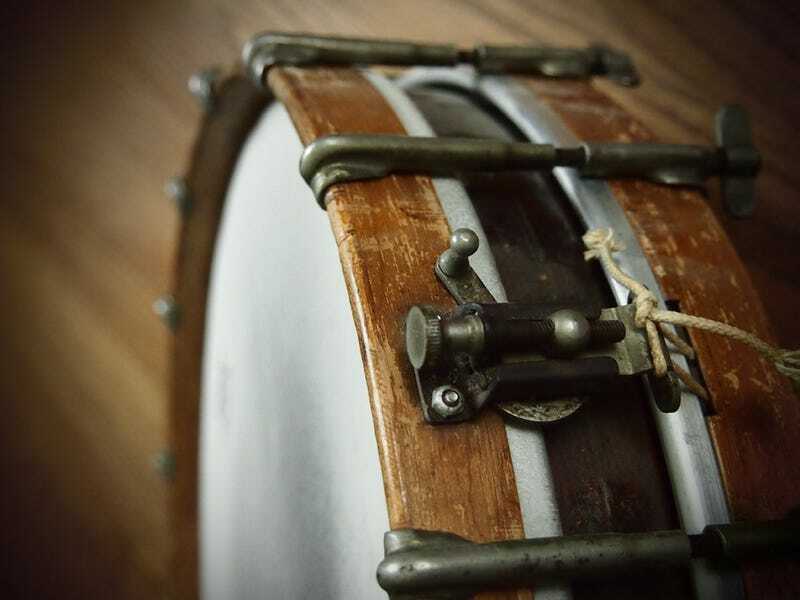 This is a 1920's Ludwig Thumb Rod snare drum given to me as a Christmas present, by a girl I really liked in high school. She found it as a bag of parts, labeled as "tambourine" in an antique store. Turns out all the parts were present, and it sounds great. Me and my dad reattached the snare strainer (pictured) with more solid modern screws, so it could once again be played. This hurt the value somewhat, but instruments are meant to make music, and I have no intention of ever selling it, so, no regrets there. The girl who gave it to me just wanted to be friends, of course, and I haven't seen her in a few decades. I've recorded with the drum a few times and still take to friends' houses for holiday party jam sessions. Olympus Pen EP-3 with 14-42 lens and macro adapter. I used the camera's "Pinhole" and cross-process art filters with a little desaturation and levels in Photoshop afterwards. Canon 7D with EF 24-105 mm lens at f22 for 10sec and 100 ISO. I have had this old camera for a number of years – it was my grandfather's. I decided to take a picture of it in the location it has graced for years on my shelf. I couldn't seem to get enough natural light to get a decent exposure, so I took several brackets for an HDR; since they were still quite dark and I didn't want to increase the ISO, I took one more with the flash, then combined them all using HDR Efex Pro's plugin for Lightroom. Taken with my Nikon D200 with my Tamron 70-300mm tele-macro, f/5.3, 1/40 sec, ISO 800. When i saw the contest i knew exactly what i wanted to shoot. It's a Heirloom, witch i got from my grandfather when he died about 12 Jears ago (I was 8). It's the only thing i got from him and i love it. I love the detail, the color and that it's from my grandfather. I wanted to put it on a old cabinet as background but i didn't have one so i used a white paper as background and two flashes to light it. This is my grandfather's camera equipment. In his life he took thousands of pictures, of which I have recently had to sort through all his slides. He died a few years ago and stopped taking pictures a few years before that because of his illness, but all of my childhood, I can remember either my brother, my cousin, or myself on his lap, and his camera over his shoulder or sitting right next to him. He wasn't the best photographer, it was all just a really expensive hobby for him, but being around the camera made me fall in love with it too. His stuff has been sitting in my grandmother's closet since he died, so last month I asked her if I could have it, and it will probably forever sit in the shoe box she kept the camera in. It isn't really an heirloom yet, but I know I treasure it and I hope my future children or grandchildren will appreciate it as much as I do. The subject of my photo this week is an old tea kettle from Britain (approximately 150-200 years old). I made some tea with a separate kettle and poured it into some tea cups. I put it on a coffee table that has also been passed down, and matches the color of the kettle. The pale light from the window lights up the copper and also illuminates the text stamped into the metal. I found this straight razor last August in an antique shop on the way to the cottage. The woman there sold it to me for five bucks and I really had no idea how much it was worth or if it could be restored. I took it home and did a bit of research and thanks to some online forums I found someone nearby that restores vintage razors. He disassembled the whole thing, replaced the pins, buffed and refinished the blade and soaked the bone scales (handle) in oil for a week to bring back their luster. He honed it, showed me how to strop it and I taught myself to use it and plan to for as long as I can. Low investment, good restoration, shaving win! A good friend let me into his studio this weekend to play with some serious camera gear and create this shot of my (new) heirloom. While the choice of subject was immediately obvious to me - this is a hand embossed "calling card" from an 1894 forefather - but giving an object that has survived a century proper context proved to be more of a challenge. In particular, getting the "depth" of the hand embossing and/or paper aging. Here is a photo of an old cigarette case. It has a bit of a murky history - it belonged either to my great-grandfather, or to my great-great-grandfather. I found it in my grandfathers house, and I've had it for years. I believe that it is approximately 100 years old, I presume that it dates back to either World War I or to First Balkan War of 1912-1913. I wish I had a different item to show you. My family owned a battle mace, along the lines of the one shown here in the middle photo, that was found on the attic of my great-grandfathers house about 45 years ago. Unfortunately, it was seized from my uncle's house during the Civil War in Yugoslavia, and we never found it again. That is basically the only real heirloom we owned, and now it is gone. Photo was taken with Canon 50D and Canon 17-40mm f4L, at 40mm, f4.0, ISO 320, 1/50sec shutter speed, on a leather ottoman, under ceiling halogen lights. It was cropped in Lightroom 3, converted to B/W in Lightroom, and then exported to Photoshop where I added a yellow filter, and that was it. Here is my submission for this week's photo contest, titled "Od Housekeeping". This was my great-great-grandfather's Good Housekeeping Cookbook that he used when he was a chef back in the 1950's. The cover and spine are just barely held together by some tape, and it's filled with his notes and his own recipes he added. It has a lot of character, and it is one of my family's treasured possessions. Shot with a Nikon D70 with a 50mm 1.8 lens, (which is also a bit of an heirloom, as it was passed down to me from my dad) at ƒ2.8, ISO 320 and edited with Filterstorm Pro on my iPad, and Aperture 3 on my Mac. The background is a black hoodie. house with a tripod. It was processed in Photoshop CS3 to give it a dark feel. one an early 1900/late 1800 wall clock his family had purchased during the British Era in India and another a very petit hand clock much like the one shown in this picture. Sadly, he had lost this hand held clock over the years and I have heard him speak about it with much passion. When I mentioned this to my then girl friend, she was very sweet enough to buy me this hand held clock from Prague with a beautiful 'Praha' engraving in the front. The dark nature of the photograph is for obvious reasons. My subject as you can see is The Asahi Pentax camera. This camera belonged to a dear friend of mine who is a veteran of the Vietnam War. He bought the camera while he was on duty during the war. He gave it to me as a gift knowing how much I love photography. For me a year ago, using film was always frustrating because I didn't know much about photography. I believe true photographers take amazing shots despite of the camera they use and whether they're using digital or film. I haven't used the Asahi camera yet but I will soon because I think i'm ready for film now. The gear: Graflex Crown Graphic with Wollensak Synchromatic lens, shot on Polaroid Type 54 Polopan (ISO 100) instant film. Exposure: F/22 at 25 seconds. Scanned on Canon MP250. Technique: Shutter is broken so instead of setting it on my own I did a manual bulb setting by opening and closing the preview lever as needed to create a 25-second exposure. Focusing was done via ground glass so I could use the drop bed and movements to control what is in focus and what isn't. Lighting is a bunch of bedroom lamps.Scanned on my printer/scanner/copier and edited in Photoshop CS2. it's actually the first photo I've scanned on this scanner. The story: This Elgin watch is about 90 to 100 years old. It was given to me by my father-in-law not long after I proposed to his daughter. It keeps excellent time. I take it with me to more formal events so I can tell the time without getting out a cellphone. The camera is ~50 years old and while the shutter needs repair, which will happen later this month, the movements are in great shape and the rangefinder works well too. The camera was also a gift from my father-in-law, who, it turns out, actually likes me. I actually like him too. It is my great-grandfathers 1920 Ithaca 12-gauge side by side. It's been in use and in my family since then. I never met this great grandfather, but his son, Pete, has been a huge influence in my life. I went to the same college he did, I've taken up the same hobbies (mostly sailing), I'm in the same industry (Marine Engineering), and we still see each other often. I'm even getting married (despite the fiance not being thrilled about the weapon in the house!) in the town of his summer house, where I spent a lot of time growing up! Pete and his wife, Sallie, did Christmas with our family, and he was so excited when I opened the package the Ithaca was in. It was a great Christmas. I shot it with my Nikon D80 with the 50mm (75mm Equivalent) 1.8 Prime wide open for 1/40th at ISO 100 under a work light on my shop table. I wanted a real shallow DOF, and it certainly looks like I got it! I do most of my shooting on manual mode with manual focus, and I made sure to focus on the word Ithaca and the barrels. I spot metered to over expose the chart its resting against and then made some adjustments in Aperture (exposure, white balance, saturation). I used a mono-pod to steady it since it was pretty slow. Thanks, what a great Shooting Challenge topic! I have an old stamp collector book handed down through my Grandpa, though I do not think he started it. I shot this particular page mostly because of the history of the stamps on it, though I was also trying not to disturb the fragile book any more than necessary. These six stamps are from Bosnia - Herzegovina around the time of WWI. The stamps with holes punched in them were purposely defaced and then sold as a national action to show Bosnian contempt for their former Austrian rulers and the stamps they made. I loved the coloring and condition of the blue stamp, so I worked on focusing it while still showing the the other stamps and text sufficiently for recognition. However, I did want the focus to be on the two people in blue, Archduke Franz Ferdinand and his wife Sophie, whose assassinations started the genre we call "World War." The shot was composed with the book propped on the couch on a black cloth, with my dear wife carefully angling a single halogen light from the side to catch the page texture and stamp topography. Shot with a Canon EOS Rebel T3i, 1/30, 1600 ISO, f 8.0, kit 18-55 lens. I enhanced the coloring and exposure very slightly in iPhoto. I got this camera from my grandfather when he and my grandmother were moving from their house where my father grew up in. This polaroid camera served my grandfather and father, now my grandfather gave it to me. My grandfather told me to "guard this camera with my life" even though he was joking I knew the camera was dear to him. Although I haven't gotten to use it I hope in the near future I can. I wanted the original photo normal with no blur although my phone didn't agree with me. I thought the HDR photo was done so I brought my phone down to look at the shot . Realizing it wasn't done I quickly brought it up to the camera and the final part of the HDR was blurred. At first I was skeptical but then I liked the outcome. Not really an heirloom, just an old typewriter I have. Thought it would look cool with a sepia look. I got home from working out and checked out Giz as usual and saw that the shooting challenge was to shoot an heirloom. Right away I looked over at my grandfathers favorite camera for almost 20 years, an old Bell and Howell camera. I wanted to make the photo of the camera look as if I took it with the camera itself, so I used yellow lighting and a wood background. It was taken with a couple of years old Olympus SP-55OUZ, it's not an interchangeable lens camera so i had to take like 50 shots until the camera finally focused right! iso 1K — silly, I know. I brought the desk clock and and the spyglass back for Stepdad after digging through an old antique market in Sharjah in the United Arab Emirates while on a documentary trip I took last spring. The market was something straight out of Indiana Jones. Stall after stall was filled with brass and copper antiques from over 100 years. Old guns predating World War I, Soviet Army helmets from the cold war, silver and gold urns from the — what the locals told us, that were from the 1800s — and pearls on strands that you could buy by the meter if you wanted. This is my first time submitting to one of your Shooting Challenges, inspired by your theme and example shot. I happen to have a pocketwatch that's been handed down to me from my father, who received it from his father, who bought the watch in 1906. As a child, I enjoyed seeing the pocketwatch among my fathers belongings, utterly fascinated by the mechanism beating away inside (it has a screw away back, exposing the movement). It was akin to discovering a whole universe, inside something slightly larger than a postage stamp. I was hooked. As an adult, I now work in the watch industry (I even write for HODINKEE), and that pocketwatch has never left my thoughts. It keeps me grounded in my family history and serves as a reminder of the rich heritage of my passion. Took this shot with a Nikon D5000. Stock Nikkor DX 18-55mm lens. Exposure 0.001 sec (1/800), Aperture f/5.6, Focal Length 52 mm, ISO Speed 640, Exposure Comp +2.0. My grandparents died when I was very young and this decanter label is one my earliest memories of them. Whenever we would go over my grandfather would pour himself a bourbon and sneak me a little in a glass with water (when my parents weren't looking). I loved it. The clank of the label is still fresh in my mind. Years later I found it in a drawer at my parent's house and I quickly snatched it for myself. My friends think it's funny that my earliest memory isn't of a stuffed animal or a childhood friend but me drinking bourbon with my grandfather.